Bristol is the largest and most lively city in the south-west of England and its waterside location, lined with historic buildings, tourist attractions, boats and restaurants, makes a visit to Bristol quite unforgettable. The city is full of energy and excitement, and has even been nominated as a European Centre of Culture. Every year, Bristol has an exceptional programme of events and festivals, which include balloon fiestas, kite flying, theatrical performances, art exhibitions, open-air concerts and street carnivals, reflecting the city's diversity and style. There are numerous tourism outlets in the city, with the official Bristol Tourist Information Centre (TIC) being located on the Wildscreen Walk at the Harbourside, where for just a nominal charge you can purchase booklets such as the Slave Trade Trail and the Bristol Heritage Trail, as well as the useful fold-up David Haslam Bristol Visitors Map. 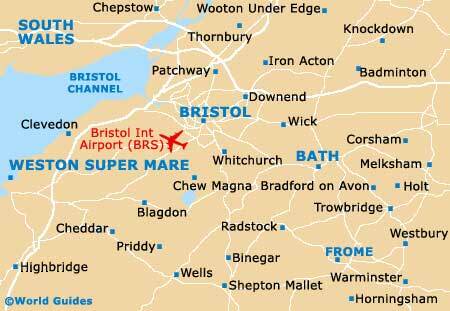 Accommodation in Bristol can be a little expensive, but there are certainly a large number of hotels to choose from, including many well-known brands and also a number of independent options. This is a thriving financial city and therefore hotel rates are often high during the business week. However, there are some excellent value deals to be found, even in the heart of city centre, particularly when you book in advance and choose a weekend break. Some of the most popular local hotels are to be found around Clifton Wood, the Harbourside, Hotwells, Redcliffe, the West End and within walking distance of the Old City. Bristol has a large river that weaves its way through the city centre, the River Avon, and this forms part of a system of waterways that made Bristol a great inland port, bringing tremendous wealth to the city. The Harbourside area has become a popular tourist attraction in its own right, with boat trips, cafés, restaurants and walking trails. Other tourist attractions in the city include Bristol Zoo and Gardens - awarded the prestigious title of 'Zoo of the Year' by the 'Good Britain Guide' in 2004; the world-famous Clifton Suspension Bridge - created in the mid-19th century by Victorian engineering genius Isambard Kingdom Brunel; the SS Great Britain - the first large iron ship to be driven by a screw propeller, powered by steam; Bristol Cathedral - founded in 1140 as an Augustinian monastery, this grand cathedral is full of history; the highly regarded Old Vic Theatre - home to one of the country's best known and most successful theatre companies; the Hippodrome - with many regular West-End theatrical productions and musicals; the Colston Hall - the city's largest concert venue attracting many major pop and rock artists; the Clifton Observatory and Caves - featuring a viewing platform with spectacular views across the Avon Gorge; and the Bristol Blue Glass Factory - which has been manufacturing handmade glass since the 17th century. 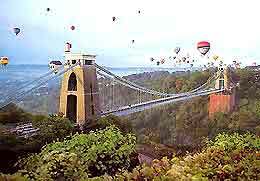 More information about Bristol Tourist Attractions and Bristol Landmarks. 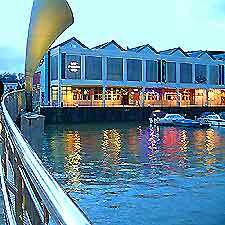 The award-winning 'At Bristol' family attraction is one of the newest tourist attractions and is situated in the heart of the harbourside area. Funded by the National Lottery and opened in 2000, At Bristol cost in excess of GBP 100 million and has a number of different, impressive attractions for visitors to enjoy. The large At Bristol complex also features many special events throughout the year. Attractions include the Explore area, the IMAX cinema, the Blue Reef aquarium, a planetarium, cafés, bars, restaurants, a large car parking area, and many exciting, interactive displays and exhibits. Other attractions close to Bristol include Bath - one of England's most beautiful, elegant and historic cities, full of spectacular architecture and Georgian streets; Stonehenge - a most remarkable and intriguing monument, known throughout the world; Westonbirt Arboretum - containing a world-class collection of trees and shrubs; the Castle Combe Race Circuit - a popular motor-racing circuit with a racing school; Dyrham Park - owned by the National Trust, with a grand mansion that dates back to the 17th century; Stourhead House and Gardens - less than one hours' drive from central Bristol, featuring some of the most spectacular landscaped gardens in the west country; and numerous small, picturesque villages. Bristol is a truly cosmopolitan city and has numerous excellent art galleries museums, providing interesting information about the city's bygone days. Some of the major cultural draws here include the Bristol City Museum and Art Gallery - one of the city's most popular and important attractons of its kind; the Watershed Media Centre - located in the Harbourside area and home to many different attractions, including two large art galleries, photographic exhibitions, films, digital media, and numerous regular events; the Bristol Industrial Museum - with many interesting exhibitions about the city's important maritime past; the Georgian House - which provides an interesting insight into 18th-century city life; the British Empire and Commonwealth Museum - with 16 themed galleries explaining the history behind Britain's empire; and nearby, the International Helicopter Museum, situated in the seaside town of Weston-super-Mare - featuring more than 50 helicopters and aircraft. The university city of Bristol has grown into an important financial city and there are an enormous number of large office blocks and headquarters for many of England's leading companies. These businesses include banks, telecommunications, insurance companies, law firms, software companies, printing, publishing and more besides. Many of these are located in the centre of Bristol, close to the Temple Meads train station, and on the outskirts, in the Bristolian districts of Avonmouth, Bishopsworth, Brislington, Clifton, Cotham, Fishponds, Frenchay, Henbury, Horfield, Knowle, Redland, Shirehampton, Stapleton and Westbury on Trym. 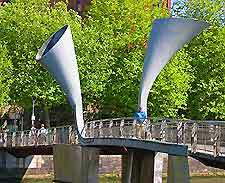 There are many different guided tours of Bristol available, such as bus tours, boat tours and walking tours. Hot-air balloons regular ascend from Ashton Court Park, nearby Bristol city centre, and offer some of the best possible views of this beautiful and friendly city.